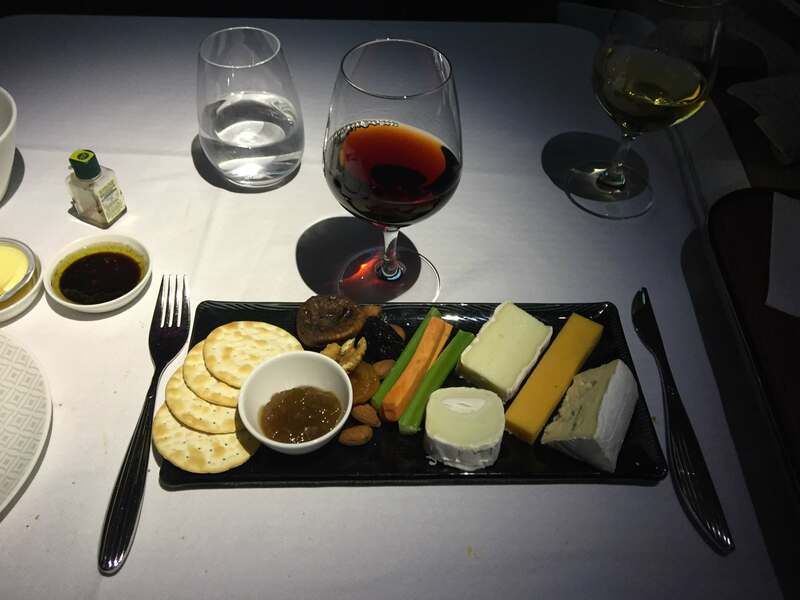 I shared my recent story about an exciting flight from Paris to Doha in first class on Qatar Airway’s A380. While the ground experience was nothing special, everything changed once we boarded and shortly after taking off. After spending some time in the gorgeous on-board bar, it was time for dinner. 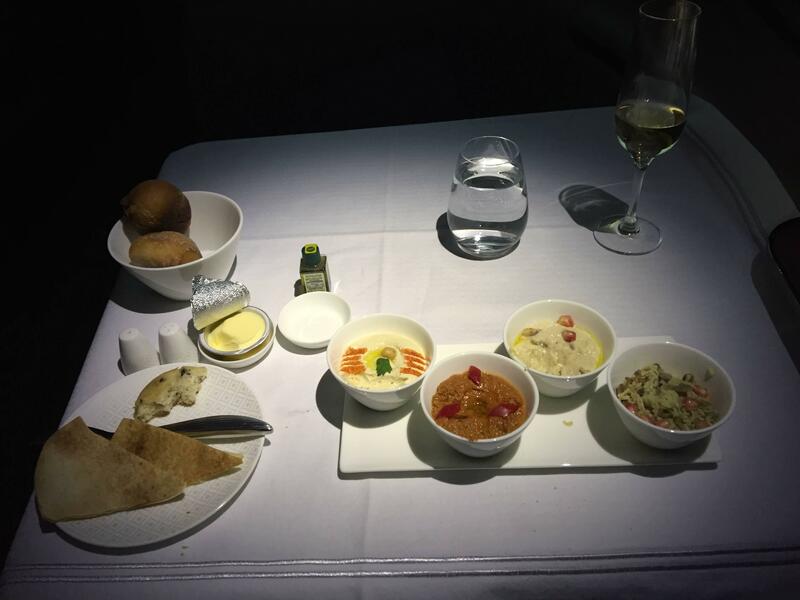 Once we returned to our seats, our flight attendant greeted us warmly and asked if we were ready for our meal. I told him we were, and he went to work right away. Without hesitation, I’d ordered caviar to start. Who could resist this? Next, I enjoyed a classic Arab Mezze. Each dish in this course was more than enough for me to sample and savor, so I had to make a conscious effort not to eat too much. For my main course, I had shrimp with a salad and sugar snap peas. While very enjoyable, I didn’t love the breading on the shrimp, but the dish was still very good. I ordered cheese for my last course that came served with crackers, almonds, some dried fruit and a preserve. I took a break from the champagne and ordered a glass of port. After a wonderful dinner (and several glasses of wine), my fiancé decided to get a little rest. Our flight attendant asked if I needed anything else, and I told him I’d planned to go back to the bar for another drink before going to sleep. “They’re expecting you,” he replied. As I made my way back to the bar, I thought that was a funny response. Maybe he was just being extra nice, or perhaps he and the bartender had spoken and let each other know of my intentions. After a moment, I didn’t think much of it, and I made my way through the curtain to the bar area. I was startled. A large group of people I didn’t know (other members of the crew and a few business class passengers) were shouting. My first thought was that this surprise was intended for someone else. But I quickly realized this surprise party was, in fact, for me. A flight attendant came up to me and said, “Where is your beautiful fiancée?” as she held a bouquet of roses she had made. Still in shock, I realized this party was meant for us, the newly engaged couple. Uh oh, she went to sleep. I looked around and saw the effort put into this impromptu event. I had to go get Sarah. I told the crew and other guests that she had gone to bed, but I would get her and bring her back to see everyone. As I walked back up to the front of the plane, I contemplated what to say to convince her to follow me to the bar while not spoiling the surprise. Unsurprisingly, she was a little groggy but I told her I had to show her something that would only take 10 minutes. Reluctantly, she put on her slippers and followed me to the back again. Immediately, Sarah knew what was up. I could tell she was tired, but she had a big grin on her face. Everyone who greeted me a few minutes earlier had stuck around to surprise us again. Sarah assumed I had arranged this, but I had nothing to do with it. One by one, people came up to congratulate us. The flight attendant who had made the bouquet gave it to Sarah and more champagne bottles were popped. A few minutes later, another crew member presented us a plate where she had arranged a cake and fresh fruit and written our initials around the edge “Congrats R and S.” Simply amazing! Before we could eat this beautiful plate of food, the crew wanted to take lots of pictures. They borrowed our iPhones to snap some pictures and also wanted to take picture with their own phones and tablets. From our short interaction about our engagement with the bartender, he must’ve alerted the right people to throw us a little party. Looking back at the pictures, you can tell how genuinely happy everyone was for us. We just couldn’t believe the great lengths they crew went to, and I had absolutely nothing to do with it. Since the crew was working, they couldn’t drink of course, so after a few minutes, the crowd dispersed. Sarah, too, wanted to go back to her seat to try and get a little rest. Even though I’d had two more glasses of champagne, I still wanted to sample that Johnny Walker Blue. My pal behind the bar was happy to pour me a glass. After this last drink, I needed to get some rest. Unfortunately, I only had about 45 minutes to test out my lie-flat bed before the lights were turned on and the crew was waking people up to prepare for landing. My nap had been cut short, but I was on Cloud Nine after such an incredible flight. I didn’t want this experience to end. 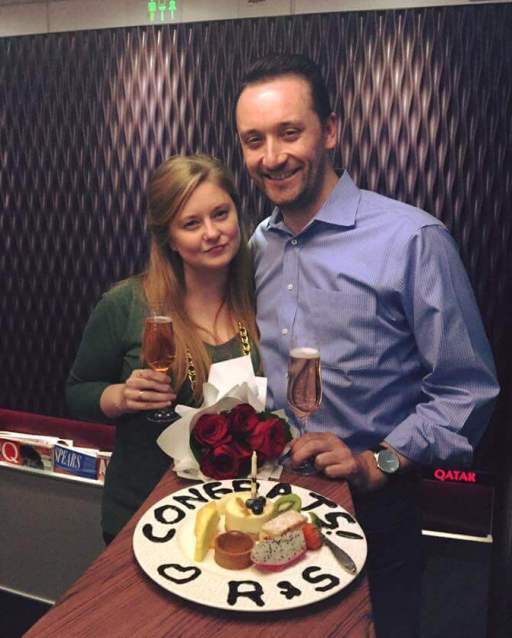 You’ve probably heard stories of people getting engaged mid-flight, but I’ve never heard about a crew throwing a surprise party for their guests. This was the most wonderful gesture ever. 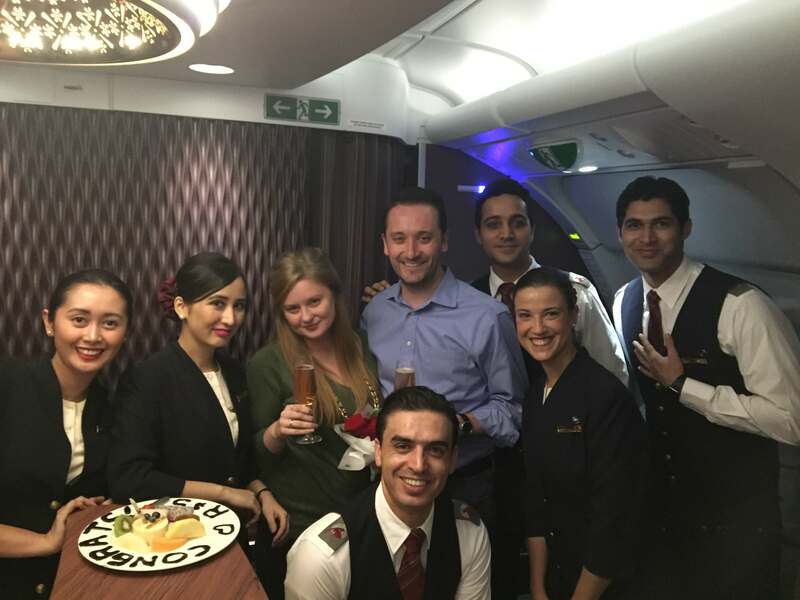 Qatar’s A380 has the largest bar space of any on-board bar, so that certainly made the special event possible. There’s no way to know for sure, but I wonder if we’d simply been in business class (or economy) if we’d gotten the same treatment. I’m going to selfishly go out on a limb and say no. Looking back, I’m still in awe of this flight. 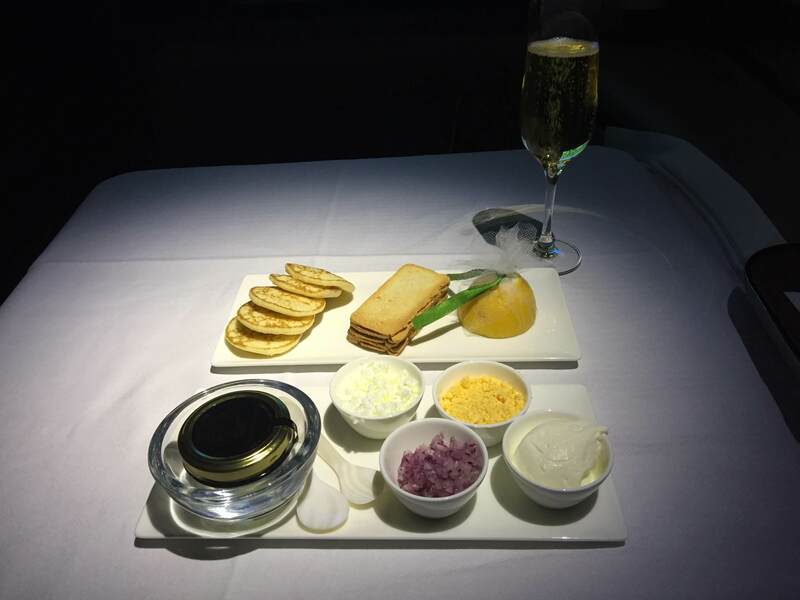 Sure the food was amazing and the bar on board was stellar, but the simply incredible service of the crew will certainly make this a flight we’ll never forget.